In October we went to San Diego and I’m still dreaming of sunny hot weather and swimming in the ocean. It’s now ten days into December and I really should be thinking of what to bake, what to buy and how to survive the holidays in once piece. This weekend I’ll be at Got Craft, a craft fair I regularly take part in because it’s just so much fun. But it’s also so much work. There’s a lot of prep and stress and trust me you don’t want to see our apartment right now. It’s a big ol’ pile of mess. But I know by Saturday night when I’ve got my feet up and there’s some take-out thai food in front of me, I’ll be ready to think about the baking and making and friendly merriment. But first, let’s get this out of the way. A recipe! Bowl food is my kind of food. And the colours here are nice enough to provide some cheer when it’s dark and dreary outside. I’m not sure what it’s like where you are, but here in Vancouver it’s been DARK, DARK, and more DARK. Of course there are endless rainy days too. And wind. And storms. It’s not pretty and it sure isn’t pleasant out. But make it pleasant on the inside and whip up this tasty dish of roasted yams, fresh baby kale (or spinach) that sits on a bed of brown basmati rice (or you know, whatever grain you like best). 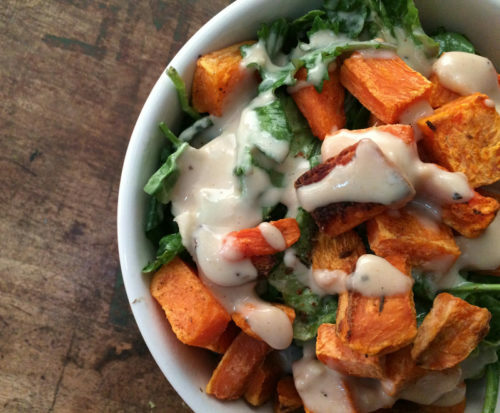 The best part is the tahini-miso dressing. I’m a big fan of throwing tahini over things but adding miso paste gives this dressing a bit of an earthy difference. Miso also lasts for ages in the fridge, so it’s always there to add an extra dimension to your salads, chicken, stir fries or veggie bowls. So you know, watch some good tv (right now, it’s London Spy but maybe stop watching after episode 3) and create your own cozy. I also have been thinking about putting together a gift guide this year. Here’s my small list of tried and true things that I want to share with you. 1. A buckwheat pillow. I have a love/hate relationship with my buckwheat pillow. It’s not the comfortable, cloud-soft pillow of my dreams, but for someone who has suffered from a stiff neck for decades, this pillow has amazing neck support and for the first time in years I’ve been stiff-neck free! I bought it locally at Dream Designs (the wool version). Beware, this thing is HEAVY. 2. Books! Here are 3 books I really enjoyed reading this year. They Left Us Everything: A Memoir by Plum Johnson . Station Eleven by Emily St. John Mandel . Can’t We Talk about Something More Pleasant? : A Memoir by Roz Chast. Note: Amazon links applied. 3. GIR: Get It Right Lids. It seems every year I get something from GIR which is pretty awesome and this year they sent me some square & rectangle silicone lids . I love them and use them all the time (I got round ones last year). They are great to replace a dirty pot lid, or as a replacement for plastic wrap in the fridge or microwave or to keep a dish warm when you’re heading out to a pot luck. Plus they look great. Note: Amazon links applied. 4. A bundle of eucalyptus leaves. Maybe you live in an area where you can pick sticky bundles of the stuff, if so, I’m envious. For me, I just head to my local florist and select a bunch of branches, along with other bits of colour and make a bundle and stick it in a vase. If you’re handy, make a wreath! Makes a great gift to yourself or to anyone who needs an bump of holiday smell and colour. Cheap and cheerful and a lift to anyone’s spirits! I hope to see some of you Vancouverites at Got Craft this weekend in North Vancouver! Free parking, easy transit, beautiful building, food trucks! There will be over 80 local vendors selling handmade goods (shop small! shop local!) and I’ll be selling Christmas cards, birthday calendars, notepads, gift tags and every other kind of card. Stop by my table and say hello!! If you can’t make it, you can also check out my etsy shop! Preheat oven to 425F. Toss the yam cubes along with oil, salt and spices. Roast on a silpat or parchment lined baking tray. Roast until the insides are tender and the outsides are lightly toasted, about 25 minutes, making sure to flip the yams using a spatula at the halfway mark. 4 large handfuls of baby spinach or kale, rinsed. No need to cook, let’s keep these fresh. (To keep things easy, I just buy a large bag of organic baby kale or spinach). 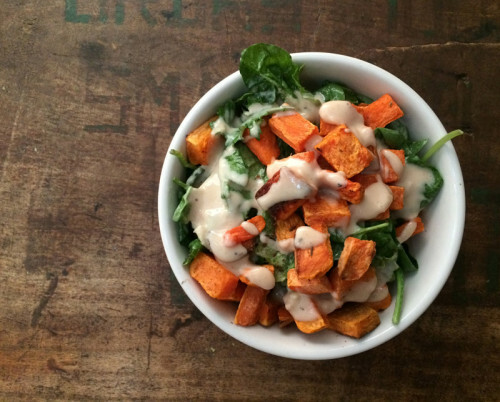 While the yams are roasting, prep your greens and make the dressing. I mix all the dressing ingredients in a large 2-cup measuring cup and use a small whisk or a fork to mix the ingredients. Taste to adjust the flavours – you may want a sweeter dressing, a spicier version or a less tangy one. If it’s too thick, add a teaspoon more of water at a time. Assemble the bowls by adding grains in the bottom, then a large handful of fresh greens. Top with the roasted yams and drizzle heavily with the dressing. If you have toasted sesame seeds I think that would make a nice addition for crunch & visuals. 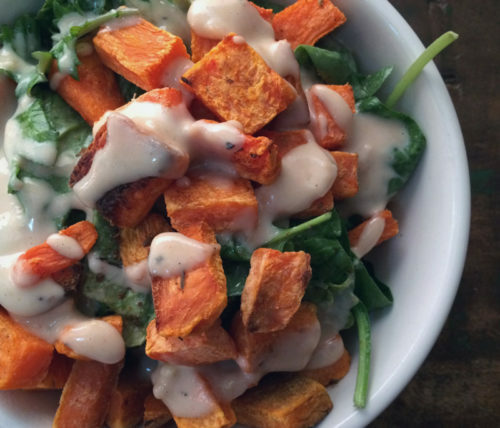 You might have leftover dressing which is delicious on any leftovers or on a green salad. I tried a buckwheat pillow once and decided it wasn’t for me – it takes getting used to! I love meals like this, quick and healthy. Good luck with your craft fair! Julie, a buckwheat pillow must be an acquired taste. For me, it’s more like a forced option without many other choices. I’m making do. RMW, I use those lids all the time. A worthy kitchen gift to yourself! This sounds delicious! Happy holidays!